Posted on Sun, Apr 28, 2013 : 3:30 p.m.
A 1995 Eastern Michigan University graduate who rode out a series of menial jobs to become an award-winning screenwriter for the Showtime series "Dexter" offered his story as an example for 2013 graduates during a keynote speech Sunday at the Convocation Center in Ypsilanti. 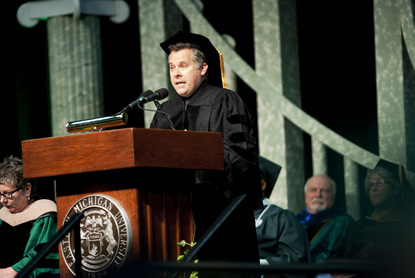 Scott Reynolds, story editor for the Showtime thriller "Dexter," speaking at Eastern Michigan's commencement address Sunday. The ceremony was one of two commencements to take place Sunday, with a record number of nearly 2,400 students graduating from the university. Reynolds’ path to success was a story of perseverance. After graduating from Eastern with a degree in English literature and theater and a minor in film studies, Reynolds moved to Los Angeles to pursue his dream to become a screenwriter. Seven years later, Reynolds said he still hadn’t sold a screenplay or been staffed on a show and began to watch his friends start to give up on their dreams and move back home. But Reynolds said he couldn't give up because he didn't have a backup plan. It was then when he got his first break working for “Touched by an Angel,” a show he joked he’d never seen before but his grandmother enjoyed. That project was short-lived but was the start of a series of assistant jobs for different shows. That effort eventually paid off. After working as a staff writer on the short-lived military drama “E-Ring,” Reynolds was hired as a writer’s assistant for “Dexter,” a move he described as a step backwards. But Reynolds continued working hard at his “menial” tasks while continuing his screenwriting work, eventually writing his own script in season two and becoming part of the writing staff. Reynolds advised graduates to make time every day to do what they love and to take chances on their path to fulfilling their dreams. Graduates said they enjoyed the speech and found it inspiring. Kimani Jeffrey, who graduated with a master’s degree in public administration, said he liked the speech because it was about hope. Mon, Apr 29, 2013 : 2:04 a.m. This was my daughters speaker at her graduation. He was the best speaker I have ever listened to. EMU YOU ROCK!!!!! !